A leading Iranian cleric said during Friday prayers in Tehran that Iranian President Hassan Rouhani should punch President Barack Obama "in the mouth when he talks nonsense," according to a Middle East media monitoring organization. 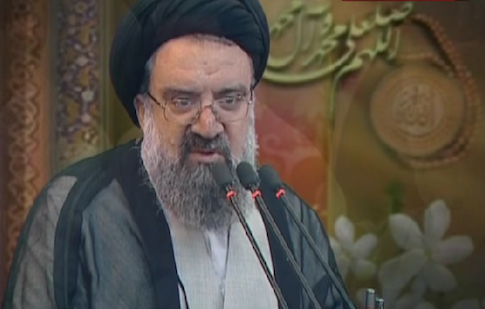 Ayatollah Ahmad Khatami lashed out at the United States during a Friday sermon broadcast on Iranian television, according to the Middle East Media Research Institute (MEMRI). Khatami called the Obama administration a "despotic administration" and accused it of conspiring against Iran, according to video obtained by MEMRI. "If the American president talks nonsense, our president should punch him in the mouth," Khatami said, eliciting from attendees roars of approval and chants of "Death to America!" This entry was posted in National Security and tagged Barack Obama, Hassan Rouhani, Iran. Bookmark the permalink.